You are here:Home » Product Reviews » My 1st Cheque From Nuffnang! So it's true, you do get money from Nuffnang! I was delighted to receive this envelope from my mailbox yesterday. After my bad experience with Google like many others, I was skeptical about joining another advertising community. My a/c with Google got suspended right after I hit USD100 when I first started blogging, without any reason. I read online about the misfortunes of other bloggers so I'd adhered to Google's guidelines strictly, did not sabotage by clicking any of my own ads as stated clearly. Somehow, it still happened to me. I was naturally upset but that's the past. 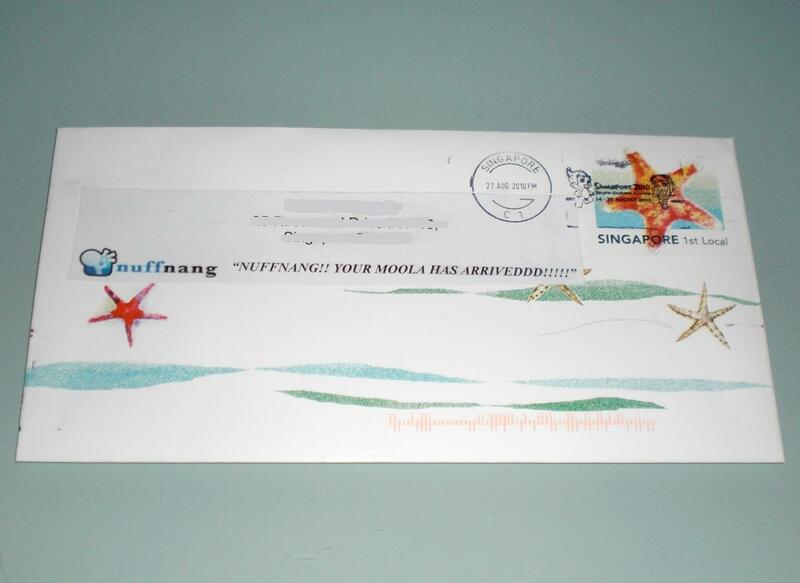 Then, I discovered Nuffnang, Asia-Pacific's first blog advertising community & have been a Glitterati member since. A Glitterati is an "Exclusive Nuffnanger", a Nuffnang blogger that has NO advertisements on his/her blog that originates from SEA & also from any ad network deemed as competitors. This is also one of the reason I haven't accepted CozyCot's offer to join them. So here's my cheque from Nuffnang! You can cash out your earnings once you hit S$50. Thank you Nuffnang, for helping me regain confidence in the blogging advertising community! Well, besides getting higher earnings, Glitterati members also have priorities over free movie screenings, lunches, contests etc. Just like their latest eSynchrony Blogging Contest to win iPad! Visit Nuffnang to find out more about advertising. Do you also have an experience to share with other bloggers? Be it good or bad, tell us your story! Wah..congrats... how long u waiting for that? Wow, congrats on your first check! You got suspended by Google when you hit $100? This is the second time I read about this issue. Makes me think again... Have a wonderful week, dear. Babel, thks for being a supporter! Rosidah, I'm sure u can find a lot of such encounters when u google. U have a good day too! I did face the same situation from google and it's very disappointing..
Wow! That's a good start, never believe you could actually get paid from these stuff. Nevertheless, u prove me wrong except there's always some "black sheep" out there. E. Valavan, thks for info! Denise, do chk it out! Wow! $170! Congrats! How long did u take to earn this amt? Thanks everyone, especially to those who've been part of the ad clicks! B. Ang, all the best & happy blogging! Congrats! How long you waited for it? Elderflowerter, can't recall, seriously. Been so long. But you'll get it in no time. Thks for visiting!